GS UFH Systems are a provider for indoor climate solutions and also for the residential and commercial building industry. Our solutions play an important role in people's lives by providing systems that create a comfortable setting for living, work and leisure. As a key part of GS UFH Systems offering to the UK market, our systems division provides a complete design, supply and installation service for indoor climate solutions. We focus upon larger scale commercial projects, our team can provide comprehensive support from building design through to Aftersales. Every person in our team plays a crucial role in delivering the most appropriate heating solution, together with the highest level of customer service to all our clients. From engineers developing the concept through to site installation and finally accounts, we have assembled a hard working and dedicated team of professional, capable and personable people. Working together, we aim to make GS UFH systems the best in the industry. Working closely with our clients and their chosen design team from an early stage allows us to provide a consultancy service which determines the most appropriate solution for their specific building. With our innovative systems we are able to bring new proposals to many projects and provide prospective clients with the opportunity to submit alternative bids. We offer in-depth modelling to determine whether a system would meet the client’s needs and we use computer assisted engineering software to determine a project’s viability for a specific type of system. GS UFH systems have been designed to allow installation into most modern forms of construction – precast, prestressed, post tensioned, cast in situ, screed and wall systems. 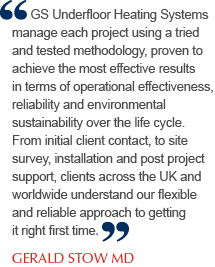 We turn development ideas into technical development by collecting and analysing data from the design team responsible for the project.Nominated GS UFH Design Engineers, experienced in your particular application, are designated to the project. The latest GS UFH software is used to design your project to the most current European Standards. GS UFH Contracts Managers liaise with the client’s project team to discuss the planning, organisation and management of resources to bring about the successful completion of the project. Dialogue with other contractors who interface with our works will be encouraged by the GS UFH team to ensure that everyone achieves a successful installation. Our systems undergo full testing and commissioning, by GS UFH engineers, before we hand the system over to the client. GS UFH also offer a full controls installation service, which provides a complete in house package to our clients and sits perfectly with our standard testing and commissioning service. We pride ourselves on the post installation support that we provide for all our clients. Each system is unique staff are always on hand with help and advice throughout the life of the system. GS UFH are able to offer a range of services to assist in post installation activities, such as Thermal Imaging and Hydronic analysis with the latest technology.